1. A female ferret is called either a jill or a sprite. Male ferrets are typically known as gibs or hobs. Baby ferrets are kits and a group of ferrets is a business, or business of ferrets. 2. Ferrets can sleep between 18 and 20 hours a day. As a result, owners of pet ferrets often mistake them for being dead when they are just heavy sleepers. Most of the time, they will not even wake up when they are picked up. 3. Ferrets have been domesticated since the time of ancient Egypt. In fact, there are some ancient tombs where ferret-like animals on leashes have been carved into the walls. Today, they are the third most popular pet in the United States other than dogs and cats. 4. Meat is a natural part of the ferret’s diet. They are carnivores and they are unable to survive if they do not have enough meat in their daily routine. In fact, since the part of the intestine that digests fruits and vegetables is missing in ferrets, they should only eat meat and poultry. 5. A ferret shows happiness by bouncing around and making loud chirping noises. In most animals, this would be the behavior of an animal ready to attack, but it’s the opposite with a ferret. 6. Ferrets normally live between 6 and 8 years, although there have been some that lived as long as 12 years. 7. A female ferret measures about 13 to 14 inches in length and weighs between 0.75 and 2.5 pounds on average. Male ferrets measure between 15 and 16 inches in length and they can weigh between 2 and 4 pounds in general. 8. While their sense of smell and hearing is very good, the ferret’s sense of sight is relatively poor. 9. Ferrets belong to the same family as wolverines, otters, weasels and badgers. 10. A ferret reaches their sexual maturity by the age of 4 to 8 months old. 11. Female ferrets have an average litter size of 8 kits. Some litters, however, can be as small as 1 kit while others can be as many as 18. 12. The gestation period for a pregnant ferret is about 42 days. 13. A baby ferret’s eyes are closed and they are deaf when they are born. They do not open their eyes or even start hearing for about 34 days after birth. 14. A young ferret’s teeth are fully developed after about 70 days. They begin to erupt after about 2 weeks after being born and the adult teeth make their first appearance at about 47 days. 15. The normal resting heart rate for a ferret is between 200 and 250 beats per minute. 16. All ferrets are born with white fur. They do not start developing any color in their fur until at least 3 weeks of age. 17. 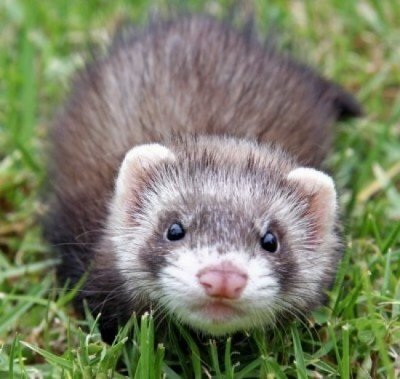 The ferret was first introduced to the Americas during the 17th century. One of their main purposes was to help regulate the population of rodents and rabbits. Hunters trained them to find the holes other creatures were hiding in so they could root them out. 18. Ferrets are relatively smart animals. They can be housebroken and they will even learn tricks. 19. One of the reasons that ferrets are popular pets is because they rarely trigger allergic reactions. Many people who are allergic to cats and dogs can have a ferret as a pet with no problem. 20. Ferrets prey naturally on mice and other small rodents. 21. While ferrets can spend most of their time in a cage without any problems, they need at least 3 hours outside of their cage for playing in order to stay healthy. 22. The black-footed species of ferret is endangered. It is native to the North American continent. 23. Black-footed ferrets can measure 24 inches long and weigh as much as 2.5 pounds. 24. A newborn ferret is so small that it can fit on a teaspoon. 25. If a female ferret is not spayed by the time she is 8 months old, she could go into a period of prolonged heat, which can be fatal.